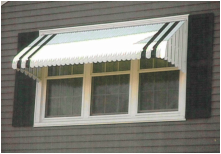 Weather Whipper is an American made aluminum awning. 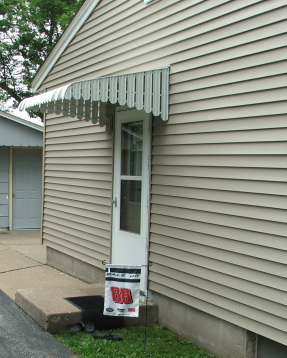 Weather Whipper Awnings are manufactured by D&K Home Products, Inc, located and manufactured in Davenport, Iowa, Quad Cities, we have been providing maintenance free aluminum awnings for over 60 years. ​Sometimes the most sustainable solution is the simplest. 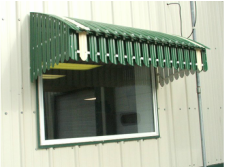 Aluminum awnings are an energy efficient product that saves you money! The style, venting, color and angle of the aluminum awnings give you the greater resistance to direct sunlight, wind, snow and rain. Best of all, you never have any operating costs, there are no adjustments to make and the only maintenance required is simple cleaning now and then. Our dealers are located throughout the Midwest and prepared to assist you with your aluminum awning solution. No dealer in your area, no problem, call our toll free number to get your aluminum awning information. As an aluminum awning manufacturer, if you are looking for dealer information, please contact us!